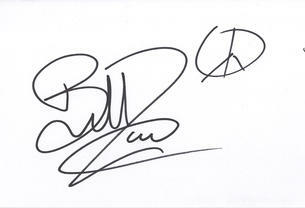 This is an In Person Signed White Card 6" x 4" by the American Actor and Director. William George "Billy" Zane, Jr. (born February 24, 1966) is an American actor and producer. He is probably best known for his roles as Caledon Hockley in Titanic, The Phantom from The Phantom, John Wheeler in Twin Peaks and Mr. E in CQ.